As a single-source provider for filling, palletising and packaging technologies, Beumer Group supports its customers in all respects supplying sustainable solutions from a single source. 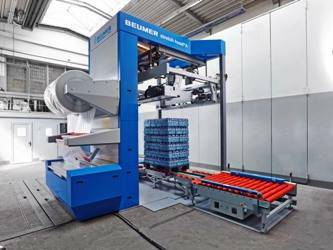 The Beumer stretch hood A sees the intralogistics specialist from Beckum redesign its tried-and-trusted packaging system from scratch. During the development, our specialists analysed various components and optimised them in terms of function, arrangement and ergonomics. This includes an intuitive menu system on the machine control via a soft-touch panel, an optimised, ergonomically designed workplace for the operator and material-friendly transporting of the film in the machine thanks to an innovative film transport system. The new system also features improved system performance and needs far less floor space. For companies in the construction material, chemical or food and beverage industries, the topic of safety when transporting and storing palletised products has been becoming more important. This is what prompted Beumer to develop a new machine in its proven Beumer stretch hood model range that offers even more practical and safer handling for the user, compared with other machines in this model range. To facilitate work for maintenance staff, and thus ensure higher machine availability, the new Beumer stretch hood A is accessable without a platform and steps. Maintenance work, such as changing the blades, or the sealing bars, are now handled at floor level. The operator opens a drawer for these activities, providing free access to blades and sealing bars. The machine is automatically brought to a standstill to protect the operator. This removes the need to move subassemblies to maintenance position. Due to this rapid access capability, maintenance work is accelerated, and the risk of accidents and malfunctions minimised. The machine’s ergonomics have also been consistently advanced. With just a few actions, and completely without tools, the operator can feed in the film. This means substantial reductions to tooling and conversion times. Additional benefits include the compact design of the Beumer stretch hood and the resulting low height and small footprint. The developers have also improved the human-machine interface to offer an even more ergonomic workflow to the user. For this, the intralogistics specialist has introduced the Beumer Group Human Machine Interface (HMI), a newly-developed operator panel with an optimised user interface and graphical navigation. This easily understandable and intuitive interaction concept helps to define efficient working sequences. The operator can control the machine safely with only a little training saving time and money, which ensures high economic efficiency. The soft-touch panel uses pictograms to guide the user through the machine control menus. The panel also gives the operator access to all required training programs. The system is controlled by a Siemens SIMATIC S7-300. Energy-saving motors and low compressed air requirements ensure a favourable energy balance. The compressed air requirements have been significantly reduced compared with the previous model. The Beumer stretch hood can be equipped with the Beumer OptiStretch system. The crimping bow, made of high-quality steel, swivels in even closer to the package, thus substantially improving the controlled application of film to the package. This improves system availability and enhances the visual appearance. The palletised goods are clearly visible through the smooth surface of the transparent, highly flexible film. Film packaging protects the goods against atmospheric influences, water, dust and insects and transport safety is substantially improved. To be able to process various films, and implement a variety of packaging processes, such as understretch or high-rack stretch, the new system can be equipped with the Beumer multistretch system. In addition, the operator receives an eLearning program via USB stick for this system. This way the employees can train themselves immediately in operating the new Beumer stretch hood A. This ensures a flexible and rapid familiarisation with the system.